Investment and finance newsletterWhat time on the investment clock? What time on the investment clock? A simple guide to understanding economic and market cycles. The Australian sharemarket is putting in a mixed performance so far in 2015, with the All Ordinaries Index sitting at 5,579 points at the time of writing. The jury is still out on whether it can or will power up over coming months towards the magic 6,000. Triggers likely to send the index higher are the reporting season beginning in earnest in early August, improving company earnings, a lower exchange rate for export earners and the Reserve Bank cash rate being held at 2 per cent. We don’t actually reach the Boom Phase on the investment clock until we get to 6,000 points on the All Ords and surpass the all-time market high of 6,800 reached in November 2007. 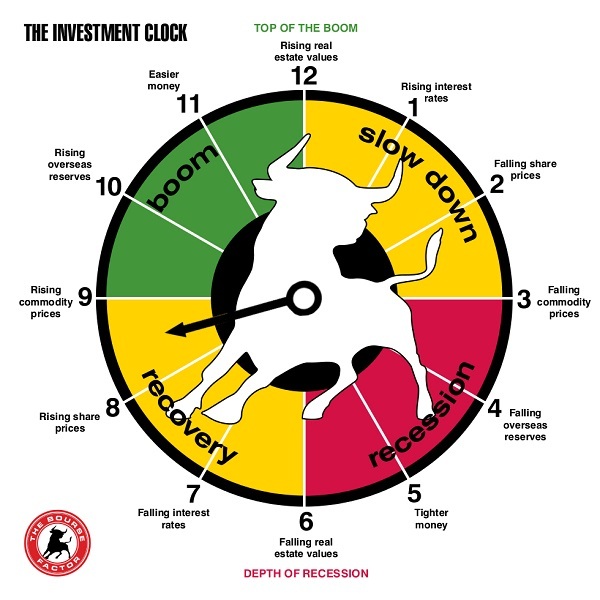 I believe the clock is at 8.30, as shown the by the arrow below – towards the end of the recovery phase, and creeping towards the start of the boom phase. To understand the process, let’s go through one typical, but not always strictly adhered to, full cycle. Australians will witness the end of the Boom Phase and the Slow Down Phase begins as business confidence begins to fall and consumers stop spending. Investors find little value in either shares or property and with impending trouble on the horizon, fixed-interest securities become very popular again. Interest rates are rising. Because property purchases are primarily funded by borrowing, the increased demand for funds is causing the cost of funds or interest rates to rise. The Government recognises that the economy is overheating and introduces measures to enable a “soft landing”, by increasing interest rates to flatten demand by consumers. The rapid growth of the property and sharemarket cannot be sustained for more than a few years and eventually the economic slowdown becomes apparent. Interest rates continue to increase until it is no longer viable for purchasers to continue investing in property and soon supply outstrips demand. The Recessionary Phase marks the peak of a downward swing in the economic cycle. Recessions are characterised by high unemployment, caused by employers shedding staff as production levels fall, cutting profitability and the need for labour. Historically, Australia has entered a period of recession (two quarters of negative growth) every seven to nine years, with our last in the early 1990s. Amazingly, we have managed to avoid another recession since then because a large Government surplus in 2007 meant we could spend our way out of trouble while the rest of the world went into recession. The decline into recession has begun. Investors find little horizon in either shares or property and with impending trouble, fixed-interest securities and cash become popular again – cash is king. Poor business confidence means that new capital ventures are postponed and initial public offerings (IPOs) become a thing of the past. This is a time where capital harder to secure and banks are not lending. This marks the bottom of the economic cycle. Investors are either too scared or cannot afford to borrow money. People try to repay debt, spend less and try to keep their jobs. This is where the Recovery Phase starts. The US Federal Reserve and reserve banks around the world begin to cut interest rates to kick-start economies. Because of the falling interest rate, long-term investors see value in the sharemarket and start to accumulate the better-performing shares. Companies are forced to become leaner and increase productivity. These measures and the slowly improving economy translate into increased company profits and this gradually stimulates share prices to recover. Australia has passed the beginning of the Boom Phase. The seeds of the recovery are sown and eventually share prices will rise as unemployment falls. Overseas reserves are rebuilt and money becomes easier. Subsequently, property again becomes an attractive investment opportunity. The improving economy leads to more aggressive market highs. A frenzy of interest and speculation begins, marking the beginning of the end of the Recovery Phase as overseas reserves continue to rise. More spending on Government projects and infrastructure is occurring, fuelling employment. Lower interest rates, which by then prevail, prompt businesses to borrow and invest in capital projects. Well before the Investment Clock strikes midnight, wise investors have sold their shares and have begun looking for other opportunities to invest their cash. This brings Australia back to the top of the boom at 12 o’clock. We are still around 17 per cent below the record market high achieved in November 2007 of around 6,800 points. In 125 years of sharemarket history the index has never failed to get back to, and then surpass, its previous high. Frustratingly, it is certainly taking some time to achieve this in the current cycle. We are now in the seventh year of the market rebuilding process since the index high point was reached. It will be eight years this November if we have still not reached it. The seeds of the recovery are now well and truly sown and eventually share prices will rise further as unemployment, which is often regarded as a lagging economic indicator, begins to fall. Share prices move through a period of gradual to rapid increases from 6 o’clock until about 11 o’clock, as commodity prices could start to increase again, overseas reserves are rebuilt and money remains easier. Will 2016 be the year we hit the Boom Phase? It often takes years (five to seven) to get to the Boom Phase of the cycle. Because of the digital age and the power of the information age, the old norms of a cyclical market have been rewritten for the 21st century. When we get to the Boom Phase, all the usual signals are there to tell investors they are on borrowed time. This is a time of maximum optimism, a feeling of real and sometimes imagined wealth, where investors have accumulated significant assets and have an attitude that favourable conditions will continue indefinitely. Rod North has been working in the financial services industry for 25 years. He is the founder and Managing Director of award-winning Bourse Communications and a regular business and investment commentator. He is author of three books, including the bestselling ‘Understanding the Investment Clock – Your Road to Recovery’. ASX Investment videos are a great way to keep in touch with latest trends and insights from some of the market's leading commentators. This article appeared in the August 2015 ASX Investor Update email newsletter. To subscribe to this newsletter please register with the MyASX section or visit the About MyASX page for past editions and more details. This article appeared in the August 2015 ASX Investor Update email newsletter. To subscribe to this newsletter please register with MyASX. This article appeared in the August 2015 ASX Investor Update email newsletter.